With the first expansion for last year’s Spiel des Jahres nominee The Quest for El Dorado the expedition into the jungle becomes much more dangerous. Supernaturally dangerous, even. Heroes & Hexes adds curses that players pick up when entering a demon tile. Curses that may force them to discard, paralyze them while the other players keep going, fun things that. Well, don’t step on demon tiles, then! But it’s so tempting. They don’t cost a card to enter and they may have a tunnel leading quickly forward. Faithful to the name, you may also hire heroes now, companions with extra useful abilities. And then there’s still familiars, demonic barricades and new cave tiles. The Quest for El Dorado was never a boring game, but Heroes & Hexes is going to spice it up a lot. Building a city is one of the most satisfying things you can do in a game, even more so when you can build in three dimensions. 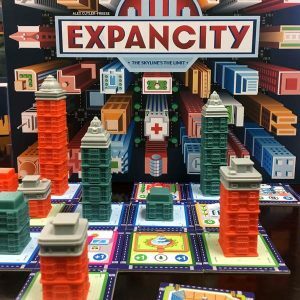 In Breaking Games’s Expancity the players build that city, starting with a street grid and then building skyscrapers floor by floor. They score points for building close to public buildings and from secret contracts with objectives. Freshly arrived on Kickstarter is a new offspring of the Key series. Keyflower hardly needs an introduction, it’s an intense auction and village building game that we fell in love with from the first time we played. Key Flow is a new take on the same basic idea, you still build your village in a new world. You’ll recognize many things, including the visual style and even some of the iconography. Under the hood everything has changed. Key Flow is a card drafting game, quicker to play than Keyflower, but just as strategic. A game of Arkham Horror just wouldn’t be complete without all kinds of ugly, tentacular monsters variously trying to eat your brain, spleen, or soul. Arkham Horror Third Edition will obviously have them, too. Monsters have seen some big changes. The random creatures jumping from the monster cup and moving around willy-nilly are no more. The selection of monsters is now based on the scenario you play, they spawn story-driven, and the ones that move do so with purpose, hunting investigators. These new monsters feel a lot like the ones from Arkham Horror: The Card Game. In KeyForge: Call of the Archons, Fantasy Flight’s Unique Deck Game, every card belongs to a House. Remember that the Houses are more than just flavor. Cards don’t have a cost to play, but every turn you have to pick a House and you may only play and activate cards of that House. What does that mean, though? What sets a House apart from the others? We’re getting a bit of answer with the first House preview. House Brobnar is a House of fighters. They value strength over all else and seek glory in battle. The preview has a bunch of examples how that translates into cards. When you’re lost in the wilderness the most likely thing to kill you is exposure, but a number of animals also make the list. Creatures like poison snakes tend to get a bigger role in games because fighting them is just more interesting than fighting cold weather. In Discover: Lands Unknown you’re threatened by both, but this preview is about dangerous beasts and how to fight them. And snakes are far from the worst that could happen to you. Discover is a Unique Game, so you’ll never know what waits in your box. Armed gangsters hiding out? The Yeti? Invaders from the center of the Earth? (Or would that be exvaders?) It could be literally anything in your game. The new Martin Wallace game coming from Osprey Games sounds like a tactical skirmish game. In Wildlands players pick from four fantasy factions, each with their own miniatures and action cards, and they fight over shards of the magical crystal that was destroyed when the Great Darkness fell and took the Empire down with it. The Mages’ Guild and the Pit Fighters are the more mundane of those factions. Why would you ever play them in a game that has Gnomads? Puzzle games where you try to recreate or fill a shape from a set of pieces are brainteasers, but not usually deep on strategy. Project L is out to change that. The goal of the game is to solve puzzle tiles, but you don’t just do that with a set of pieces you have. Instead, you build your collection of pieces by solving puzzles and receiving new pieces as a reward. So you choose puzzles that you can solve with your pieces, but that also give you useful rewards, and you try to do it more efficiently than your opponents because you all only get three actions per turn. With acrylic pieces and layered puzzle tiles with recessed shapes Project L is also a piece of minimalist beauty. 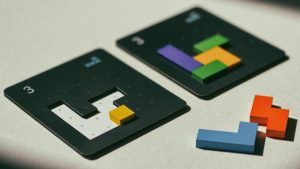 Mezo, a new game by John Clowdus and Kolossal Games, pushes the idea of area majorities about as far as it can go. You’ll only spend three ages fighting over the provinces of the Mayan empire, but in that fight you’ll pull all the stops, from your tribe’s special abilities to the special favor of your gods. Different kinds of majorities in a province yield different rewards. Strength, most warriors, most shamans, all have their own value, and all will be hotly contested. Mezo is going to be a game full of action and sudden reversals of fortune. With Castle Rampage Pegasus announced a quick castle defense card game for two players. On their turn a player draws two cards, then may play one card to reinforce their own castle and any number of cards to attack their opponent. Simple enough, but with 120 cards anything can happen. Asmodee Germany will publish a German edition of the unique, Japanese network building game Tokyo Highway (Publisher: itten, designers: Naotaka Shimamoto and Yoshiaki Tomioka). Building a forest of pillars and a network of highways between them sounds simple, but two additional rules make it very tricky indeed. One, the two ends of a highway piece have to be on different levels. Two, crossing other highways lets you place cars, which is how you win the game. The result is a maze of crisscrossing streets that makes you want to play just from looking at it. Gravity is not supposed to be confusing. If there’s nothing holding you up, you fall down. It’s when gravity becomes subjective that things get confusing. Gravity Superstar would be a simple enough game of moving around with your action cards and collecting stars. When you step off a platform you fall down until you hit another one. Falling doesn’t mean the same for everyone, though. Each pawn falls in their own direction of gravity. Even more fun, one of your action cards lets you change your pawn’s gravity to fall in a different direction. Planing a path becomes much more fun when that is an option. Gravity Superstar is still a very light game, but it has an interesting new idea.